Yelp and Walk Score data are combined to reveal cities with the most ice cream shops with the highest average rating and walkability. SEATTLE, Aug. 24, 2018 /PRNewswire/ -- (NASDAQ: RDFN) – San Francisco is the best city for ice cream lovers, with a Walk Score® of 86 and 61 locations to eat ice cream that collectively have an average Yelp ranking of 4.26. 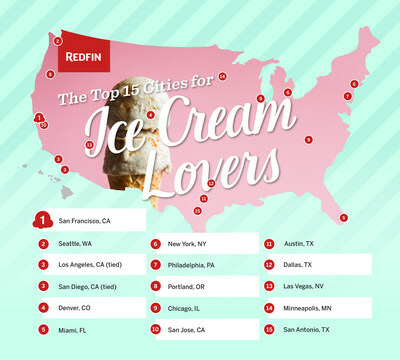 This is according to a new report by Redfin (www.redfin.com), the next-generation real estate brokerage, which analyzed 100 major U.S cities by combining Yelp and Walk Score data to find the best cities for ice cream lovers.